The driveway and parking lot are the first points of contact with your customer. Let us help you make a great first impression! At JD Asphalt Inc., we are committed to serving the commercial paving needs of our customers in Milford, Dover, Wilmington, and New Castle. We can take care of all of your commercial paving needs, from industrial roads to striping and speed bump installation. No job is too big or too small, and we will tackle just about any commercial paving job. We have all of the proper tools and products to make sure that your commercial asphalt looks great for years to come. We can pave parking lots, roads, and even driveways. Whatever you need done, call on us at JD Asphalt Inc. Once the pavement is laid, we will do all of the sealcoating and protective procedures to make sure that your commercial asphalt lasts. After having your parking lot paved, the last thing you want to do is try and find a paving contractor to finish the job. That’s why we always complete parking lots, from striping, painting, and even speed bump installation. Do you need concrete parking stops for your spaces? We can pour those too. Making your business accessible starts in the parking lot, but it extends to the front of your business. Handicap ramps are a great way to accept any customer into your establishment. We can install handicap ramps and railings in addition to finishing up your parking lot with speed bumps and stops. Our job is to make sure that you are happy with our work, so we will gladly go the extra mile. When you need colored asphalt for tennis or basketball courts, call JD Asphalt Inc. Unlike some of our competitors, we are willing to work on these unique asphalt fixtures. We’ll paint the courts as well, and do whatever it takes to finish it to your satisfaction. Do you need a repair on an existing court? We can help with that, too. JD Asphalt Inc. is your first and only choice for quality customer service and experienced paving in the Milford area. We’ve been paving driveways and roads in this area since 1948. Give us a call today for all of your residential and commercial paving needs, from the smallest crack to an entire parking lot. We’ve got you covered. 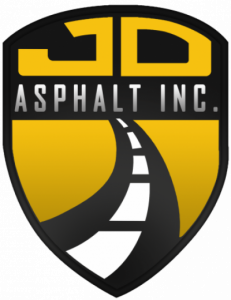 If you want to work with a paving company that focuses on customer satisfaction and top-quality results, then JD Asphalt Inc. is your answer. A family-owned business for three generations, we deliver world-class work for a wide range of services. Whether you need asphalt repair, driveway resurfacing, or a new parking lot, we have you covered.